Babbling Brook, is set on just over half an acre of land and offers contemporary living accommodation in the heart of Kerry countryside. Accommodation is spread across one level and rooms are light and spacious. The cottage is equipped with all modern facilities and has wood and tiled floors throughout. It features a large, open-style modern kitchen/diner with an opening into a sun-room with a small snooker table; patio doors lead from the sun-room onto a patio with garden table and chairs. There is a comfy lounge with three sofas, open fire, satellite TV, and Blu-ray DVD. The two double bedrooms have en suite facilities, and the twin bedroom is adjacent to the family bathroom. The kitchen/diner, utility room and bathrooms all have tiled floors. The remainder of the cottage has wood flooring throughout. Babbling Brook is not only a rental property but also a home away from home in Ireland and we hope that guests will enjoy the little ‘extras’ that a comfortable home provides. Snooker and a selection of DVDs, video tapes, CDs, books, jigsaws and games are available for guests’ use. We also like to keep some basics such as salt & pepper, olive oil, tea, coffee, sugar, spices and more, for guests’ convenience and comfort. All we politely ask is that guests kindly replace what they use. The area is one of marvellous beauty. Rossbeigh Beach is just minutes drive from the cottages and is truly one of Ireland’s most beautiful beaches offering spectacular views across to Inch beach and the Dingle Mountains. Other nearby activities include horse riding, angling, hill walking, Burkes Activity Centre, which has wonderful animal farm and of course the famous Ring of Kerry drive. Caragh Lake is situated 4km from Killorglin and a 10 minute drive from Glenbeigh. Caragh Lake is a picturesque spot on the fringe of the Ring of Kerry, rural and serene, a perfect setting in which to relax and get away from it all. Caragh Lake itself, approx 5 miles long, is set back on the opposite side of the road to Babbling Brook and can be accessed by a nearby path. Fishing and boating equipment for use on the lake is available to hire close by. Opposite Babbling Brook is Carrig Country House which boasts one of the finest restaurants in Kerry, overlooking the lake. The area is excellent for walking, cycling, bird-watching, sightseeing and other activities such as fishing, golfing, horse-riding and water sports. The Cappanalea Outdoor Education Centre, which offers a range of adventure sports activities, is just 15 minutes’ drive. 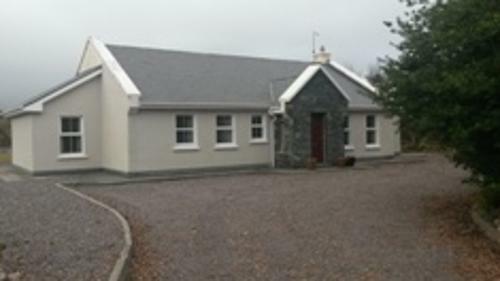 Babbling Brook is also ideally located for exploring the magnificent sights and places of interest this beautiful county offers including the Ring of Kerry, the rugged Gap of Dunloe, the Dingle and Beara peninsulas and local scenic spots situated off the tourist track, such as the Ballaghbeama Gap. The cottage is just a few minutes’ drive from two beautiful sandy beaches and several golf courses (see below). There are shops, banks, other award-winning restaurants and traditional, welcoming pubs in Killorglin – home to the Puck Fair festival – and also Glenbeigh village, both less than 4 miles away. Killarney, a larger bustling town full of character and more shops, restaurants and pubs, is a very pleasant 30 minutes’ drive and a ‘must-see’ part of Kerry. It is home to the beautiful Muckross National Park with its fabulous views of the Macgillycuddy reeks. For those who like a flutter, Killarney’s racecourse hosts several horse racing events over the spring and summer and is set in the most magnificent backdrop of mountain and lake scenery. Golf: There is a fabulous selection of local golf courses, including nearby Dooks Golf Club (a links course in a stunning location overlooking the sea), Beaufort Golf Club and Killorglin Golf Club. All are just 5 – 10 minutes’ drive from Babbling Brook. There are other golf courses located slightly further afield, including Killarney and Tralee (both approx 30 minutes’ drive). From Shannon: Via N18 to Limerick, N21 to Abbeyfeale via Adare, N23 to Castleisland, R561 to Fieries via Farranfore, N70 to Killorglin via Milltown. From Cork: Via N22 to Killarney Junction via Glenflesk, take 2nd exit off roundabout, N72 to Fossa, N70 to Killorglin. From Dublin: Via N7 to Limerick, N21 to Abbeyfeale via Adare, N23 to Castleisland, R561 to Fieries via Farranfore, N70 to Killorglin via Milltown. In Killorglin: Go to the top of the town and turn left at the Garda Station (large yellow building). Travel approx 500m to T junction where there is a sign post for Caragh Lake, take the right turn and continue straight until reaching a staggered junction. Follow the sign direction to the left for the Ard na Sidhe Hotel. The holiday homes are located approx 200m on the right.